Happy Holidays from Gail Garber Designs! As you get this I am on a birding tour of Africa! Its been a lifelong dream of mine and I am sharing this wonderful experience with my sister and two very good friends. We have seen some amazing sights, birds and other creatures. I hope you have enjoyed following my adventures this year. It was a very busy year, with a lot of teaching, working and creating. I enjoyed every minute of it, especially getting to meet some of you wonderful quilters out there. I look forward to moeeting more of you next year and maybe seeing some old friends, as my teaching schedule is busy again. 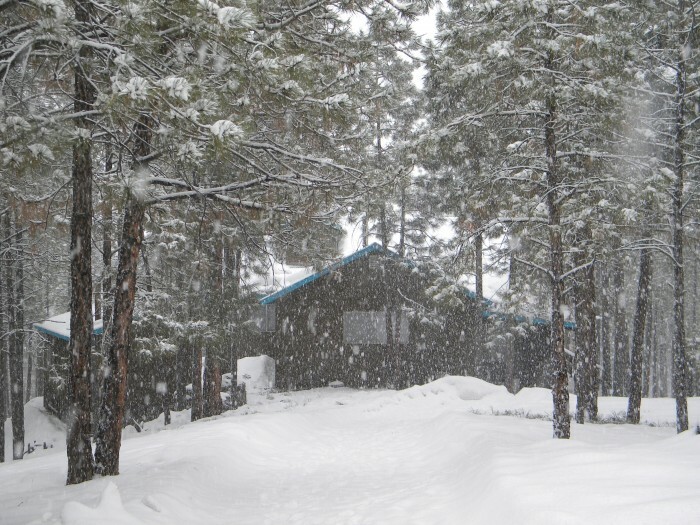 The photo above is a picture postcard view of my cabin in the Jemez Mountains of northern New Mexico in winter. The cabin is my refuge from the craziness of “real Life” and a wonderful haven for creating, relaxing and sharing time with friends. 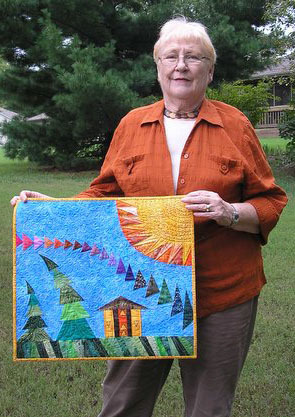 We will be there in January to work on the 2013 Hawks Aloft raffle quilt. May each and every one of you enjoy very happy holidays and a great year in 2013! Rainbow Crow is one of my favorite children’s stories: Once upon a time Rainbow Crow was the most beautiful bird in the animal kingdom, kind and generous too! One day the kingdom fell into darkness and all the animals were afraid. 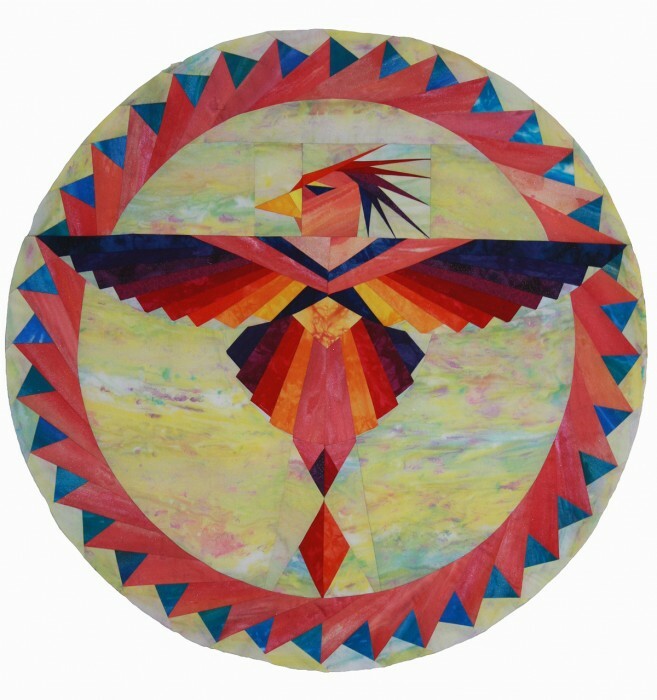 Rainbow Crow, who was very strong and very brave, volunteered to fly to the Creator to ask him to return the sun. The Creator granted his wish and gave him a lighted torch to carry the new light back to the animals huddled in the darkness. As Crow flew home, the smoke from the torch singed his beautiful feathers. His beautiful voice was made hoarse by the smoke that he breathed. By the time, Crow returned the light to the animal kingdom, he was completely black and his voice was only a croak. However, when you look closely at a crow or raven you can still see the stunning colors of the rainbow hidden among the blackness. I just finished this 24″ circular quilt top. 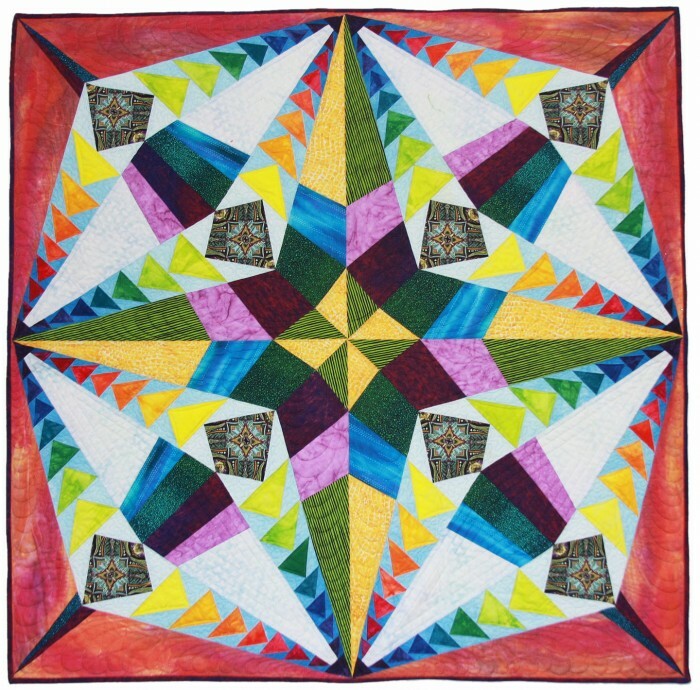 It has gone off to Kris Vierra, of Lincoln, Nebraska, for quilting. I can’t wait to see what magic she works on my version of Rainbow Crow. Azimuth, an Oldie but a Goodie! It all began with a love of all things Jinny Beyer back in 1983. 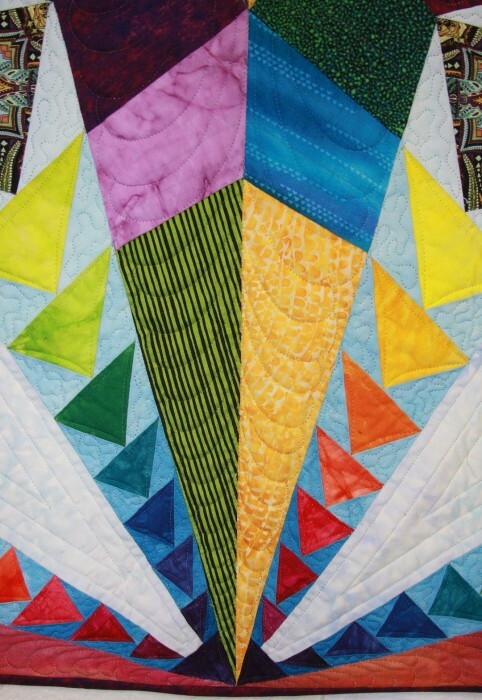 I fell in love with her quilt, Ray of Light Medallion, and wanted a quilt like that more than anything in the world. 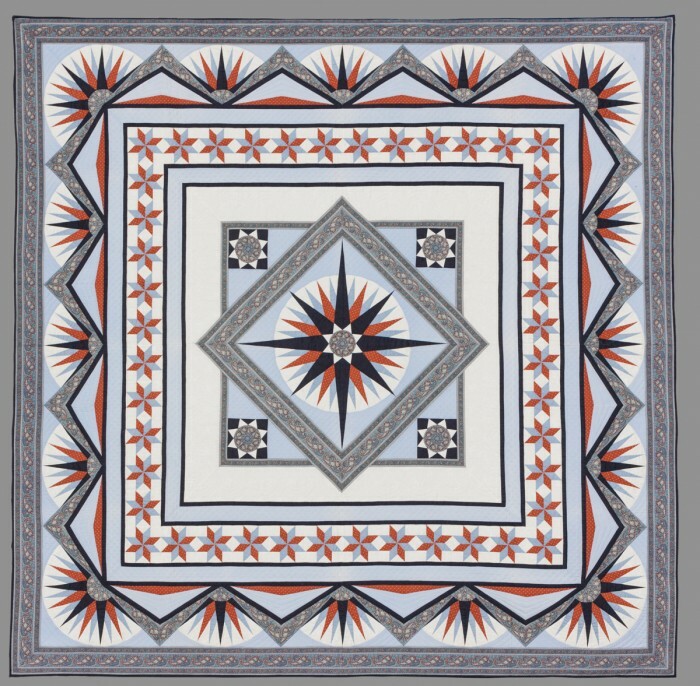 Now, I knew full well that I could not buy her quilt, so I set about learning to design my own. I signed up for a work study group called Medallion, where Ruby Chick, at age 80, was my teacher. She taught me how to design and draft. Using Jinny’s Blocks and Borders book, which was my bible at the time, I designed what was to be my masterpiece quilt. Of course, back then, quilts were ‘supposed to be’ hand stitched. So, Azimuth, following in the tradition of quilters of the time is entirely hand stitched. It measures 110″ x 110″ and was completed between 1984 and 1989. Jamie Sculley of Herndon, VA. Jamie bought $5 in tickets from me at my lecture in Vienna, VA in October 2012. Congratulations Jamie! 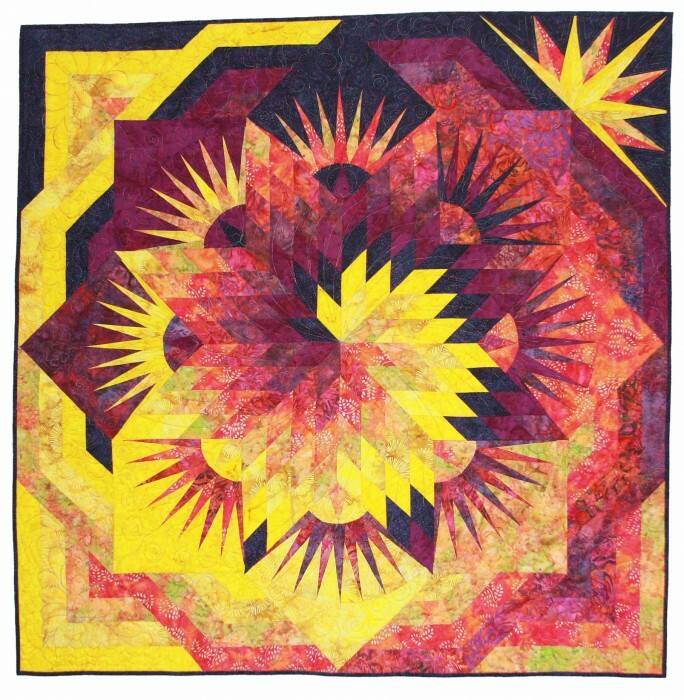 Dorry’s Round Robin Quilt, circa 1999. Imagine my surprise when Dorry Emmer walked up to me before my lecture in Vienna, VA last month. She had taken my class waaaaay back in 1997, at the National Quilt Symposium in Hamilton, New Zealand. It was there that she began a two-year Round Robin project. Two years later, at the 1999 Symposium in Queeenstown, her group exchanged the completed tops. Here’s what Dorry has to say about her quilt. 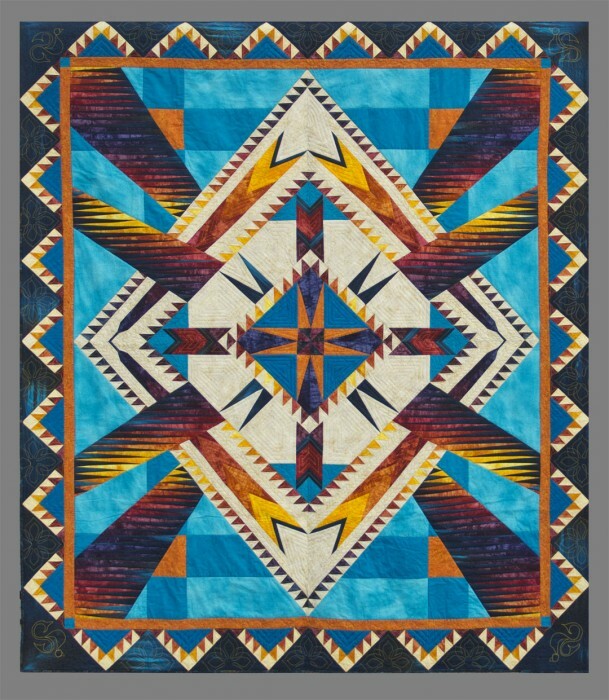 This quilt is named The TransTasman Frequent Flyer. Members of the group who made it (in the order they worked on it) were: Dorry Emmer, Kerry Payne, Kirsty Duncan, Judy Hammersla, Renchia Clark, Meryl Caudwell and then, as a Christmas gift Kerry (my sister) arranged for Donna Ward to quilt it for me. 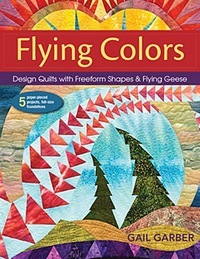 When I was listening to your presentation on October 14 in Vienna, VA for Quilters Unlimited I realized that your idea of the curved flying geese would work well for the current round I am working on in this round robin when I need to make sashing units. What goes round, comes round and back again! I hope you enjoyed your “tour” in Virginia. I certainly did enjoy that trip, Dorry! Meeting you was one of the highlights! Save Our Eagles © 1991 by Gail Garber and friends. Image by Mary Elkins. Have you ever had one of those experiences that completely changes the direction of your life? “Save Our Eagles” did just that for me. Back in 1989, my friends and I offered to make a fund-raising raffle quilt for a local conservation organization. Other than a love of the outdoors, I was not particularly interested in birds of any kind and had only a passing knowledge of raptors. But, as we hand-stitched our quilt (like many quilts of that era), I met and fell in love with the group’s first educational raptor, a Red-tailed Hawk, named Red. It had never occurred to me that being that close to a once wild bird was possible. More than anything, I wanted to work with her. Big Red (1989 – 2006). Image by Jerry Hobart. So, I became a volunteer and eventually became an employee of the organization. Big Red came to live in a large flight cage that we built for her behind my house. Each day that she was part of my life was a blessing. 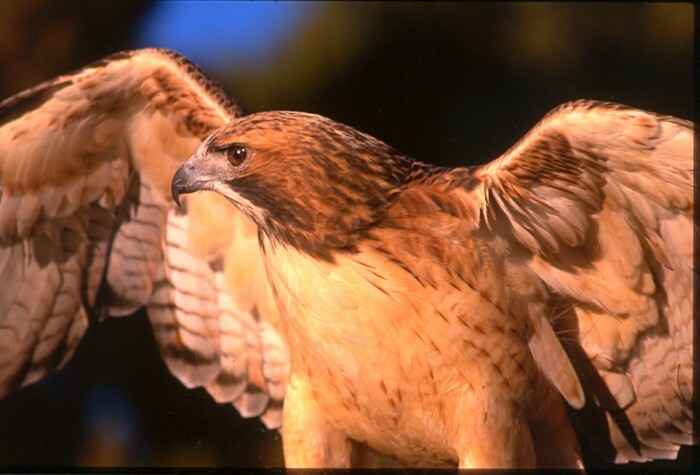 In 1994, we started Hawks Aloft, the non-profit that I continue to direct to this day. We have a cadre of about 26 non-releasable educational raptors that we use to spread our conservation message. The presence of the hawk, owl or falcon never fails to entrance children and adults alike. I know, from personal experience, that a close up encounter with one of these magnificent creatures can change lives. Because I had been a quilter long before I started Hawks Aloft, we immediately set about making an annual raffle quilt to help raise funds. 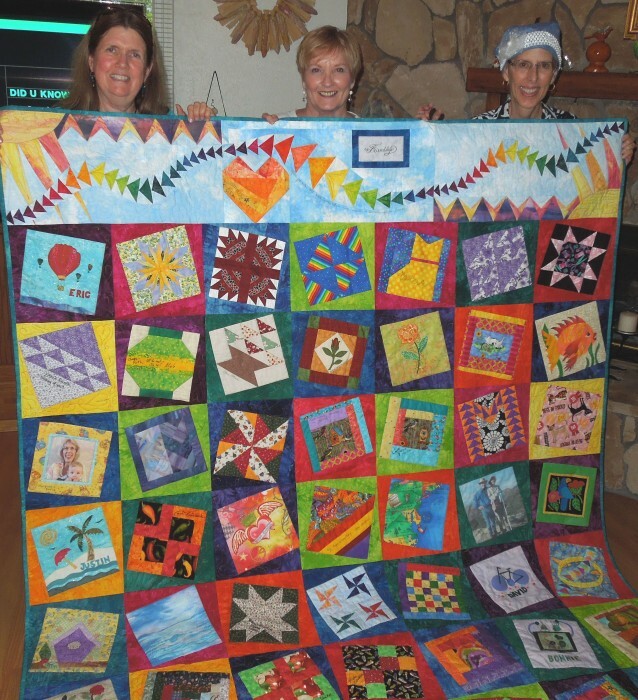 Above is our 2012 quilt, stitched by 15 volunteers in one weekend at the cabin! It was a blast and men, women and children help in its creation each year. The winning raffle ticket will be drawn on December 1, 2012 at our annual holiday party! If you would like to purchase a ticket, they are $1 each or 6 for $5. You can purchase them on the Hawks Aloft website. Just click on the icon for either single or multiple tickets. Another occurrence in 2012 affected the lives of not only myself, but also many of my friends. My friend and colleague in Gail Garber – the company, Michele Hymel, was diagnosed with lung cancer. It was a huge surprise to all since Michele had never smoked and had always been physically active and fit. 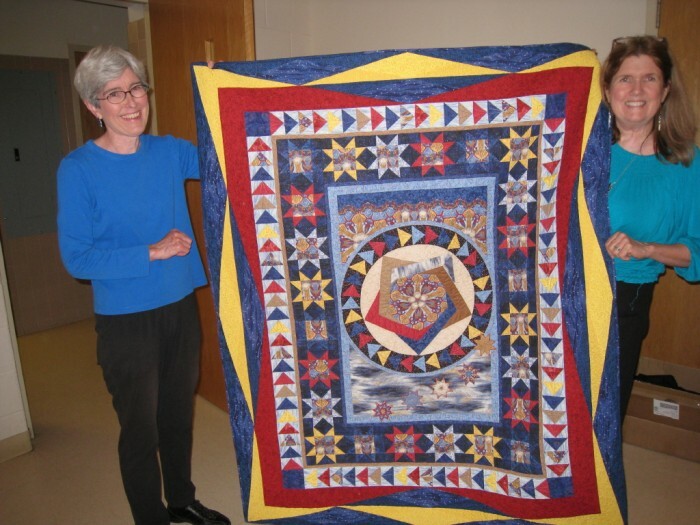 As she was going through chemotherapy, we did what quilters do — we made a friendship quilt for her. We put the word out and began collecting blocks. Several of Michele’s friends from her work at the local utility company, PNM, contributed blocks. We presented the quilt just as she was beginning the treatments. And then, a funny thing happened. 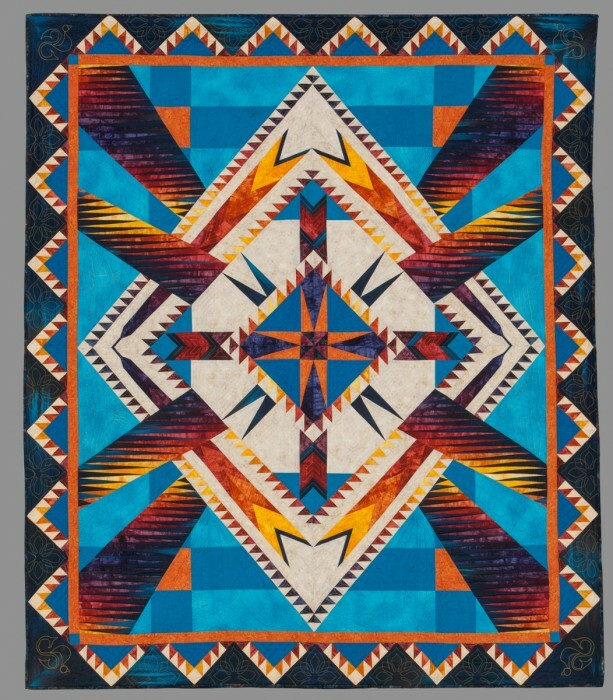 A coworker of Michele’s contacted Ed Chappelle, who helped to organize the collection of blocks, to say that she had won a quilt a LONG time ago and wanted to donate it to Hawks Aloft for a fundraiser. 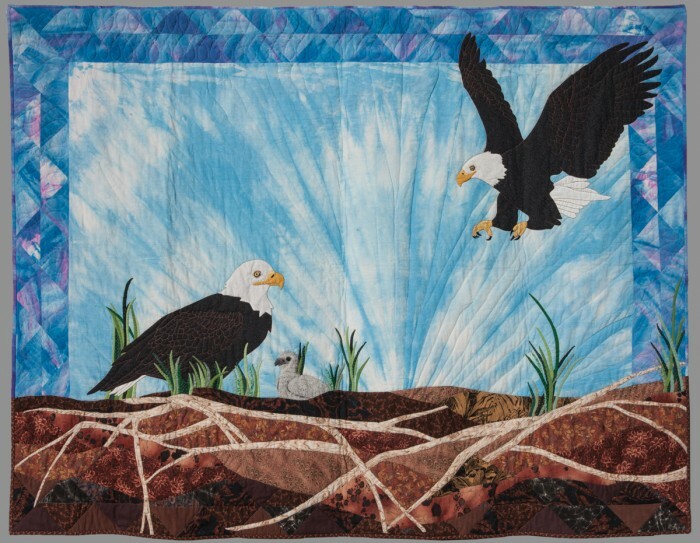 The quilt had a pair of eagles and a chick. 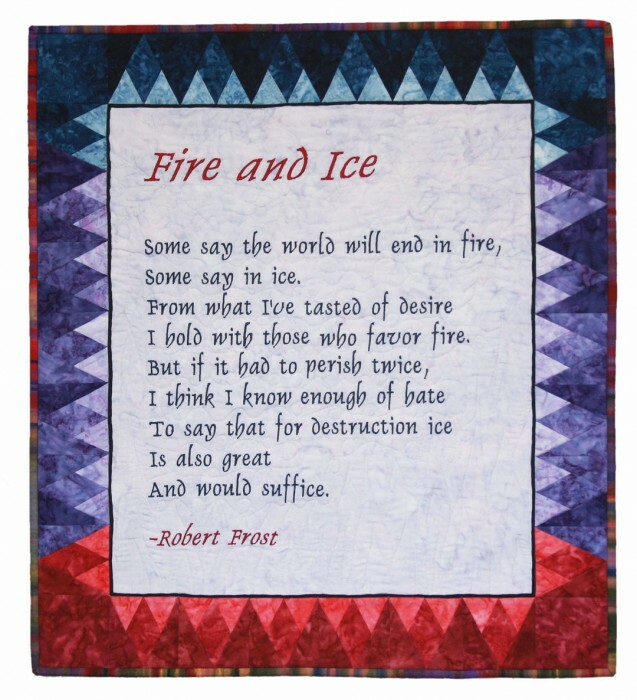 As I read his e-mail message, tears ran down my face, for I realized that it might very well be that very first quilt, the one that led me down this avenue of life. Indeed, it WAS the quilt, the one that started it all, without which there might never have been a Hawks Aloft. It is now part of my personal quilt collection and Hawks Aloft is $1,000 richer. These funds will be used for well-deserved staff bonuses at year’s end, as approved by the Board of Directors. Many thanks to Carol Palmer for this incredible donation! And, to Ed Chappelle for making the right connections at the right time! And, to all of you who have worked on the raffle quilts over our 18 year history. It’s a small world, after all. Hi Gail! Just wanted to tell you again how much I enjoyed your class at the Empty Spools Seminar this spring. I wanted to do a small piece so that I would indeed get it finished! My daughter did the machine quilting and I wish you could see the detail she put into that. Her quilting really made my quilt! So thanks again for all of the time and work you put in to make your class so enjoyable and informative! I am anxious to see all of the other projects as they get finished—you all hear that class?